A real classic that catches the eye. 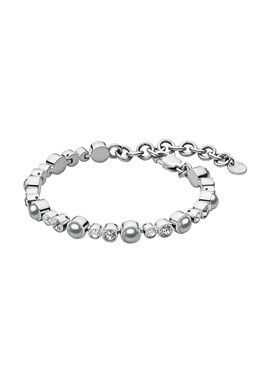 This beautiful tennis bracelet in a polished silver toned finish is set with sparkling white and grey Swarovski crystals mixed with white faux-pearls. The bracelet is a smaller version af the Teresia bracelet og works beautifully by itself or mixed with your other favourite bracelets. With lobster closure and extension.